Why an American tradition I hear you ask? Well not really, after all, we did start Thanksgiving. The main reason for including this recipe is that I know a lot of people who don’t like Christmas Pudding. This can be a festive looking alternative. The first harvest brought in by the Pilgrims was in 1621. Many had died in the preceding year due to the lack of food. If it hadn’t been for the Native Americans Indians, more would have starved as they were unfamiliar with the new plants and foods available to them. 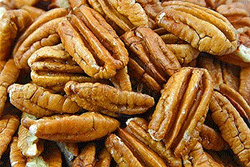 To give thanks to God for the Pilgrim’s first harvest a huge celebratory feast was prepared. Thanksgiving is celebrated in America on the fourth Thursday of November and the food presented for the celebration is not dissimilar to that prepared at that first feast. 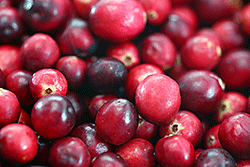 Cranberries and pecans were on the menu and to this day are still used in Thanksgiving meals. Pre-heat oven to 180ºC/350ºF/Gas mark 4. Lightly grease a 9-10 inch (23-25cm) flan tin or pie dish. Stir in the salt and sugar, the add the egg and water then mix until the ingredients are bound together. Wrap in cling-film and chill for an hour in the fridge. Whisk the eggs, sugar, golden syrup, butter and vanilla until smooth. Roll out the dough on a floured board and line the tin or pie dish. Pour the filling into the pastry case and bake for 40-45 mins until golden. This dessert really does have the look and taste of Christmas about it.